There are currently 166 people online. 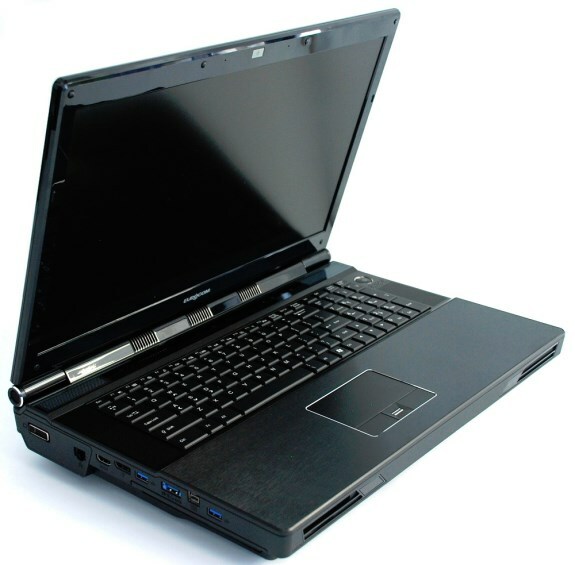 Eurocom introduced a new line of Panther 4.0 mobile workstations with Intel Xeon processors, the Texas Instruments TI X102221 FireWire 800 chipset, an ExpressCard 54 slot, 4TB of RAID 0/1/5/10 storage and more. Full details in the PR below, pricing starts at $3,210. Eurocom (www.eurocom.com), is supporting the Texas Instruments XI02221 FireWire 800 chipset interface and Intel Xeon Processors in its Panther 4.0 Mobile Workstation making it ideal for audio and video content creation professionals. The audio industry standard Texas Instruments XI02221 FireWire 800 chipset is ideal for audio production professionals because it offers low latency and high bandwidth, reducing audio glitches and drop outs. For professionals working with digital video, FireWire 800 enables multiple stream content from bandwidth intensive applications. Content creation professionals will value the addition of an optional 8 core Intel Xeon E5-2687W processor up to 3.1GHz, the option to add 32 gigabytes of DDR3-1600 memory via four memory sockets, ideal for professionals making extensive use of massive sample libraries or mixing vast multi tracked sessions. The Panther 4.0 has support for four Solid State, Hard Disk or Hybrid storage drives and RAID 0/1/5/10 availability. With support for four 1TB storage drives, the Panther 4.0 is able to offer 4 terabytes of storage. RAID 0/1/5/10 gives users the ultimate in performance or redundancy. The EUROCOM Panther 4.0 offers optional Solid State storage Drives, which do not have any moving parts so they offer perfectly silent operation during on site recording. “The EUROCOM Panther 4.0 platform allows professionals involved in sound and video engineering that can be used as a content creation lab on the go, offering the best audio and interface, stability and compatibility” Mark Bialic, Eurocom President. With the plethora of professional grade components the EUROCOM Panther 4.0 can run the most demanding versions of audio/video software with ease, such as: Cycling 74 Max 6, Sony Acid Pro, Sony Sound Forge Pro, Camel Audio Alchemy, Steinberg Cubase, Steinberg Wavelab, Vienna Symphonic Library, Presonus Studio One, Presonus Capture, Avid Pro Tools, FL studio, Deckadence, Sony Vegas, Adobe Premiere Pro CS6 and Avid Media Composer to name a few. The audio industry standard Texas Instruments XI02221 FireWire 800 chipset is ideal for audio professionals because it offers low latency and high bandwidth, reducing audio glitches and drop outs. Large amounts of redundant storage. Support for up to four storage drives, RAID 0/1/5/10 and 4 TB of SATA 6 Gb/s storage, ideal for those with large amounts of data. High performance desktop processors and Intel X79 Chipset, LGA 2011 socket. Driving the system is a complete line of 6 core and 8 core Intel Xeon and Intel Core i7 Processors based on the LGA 2011 processor socket for serious processing power to mix vast multitracked sessions or heavy users of samples. Multiple I/O ports to connect to a variety of specialized equipment. 3x USB 3.0 ports allow for high speed data connectivity. High definition audio interfaces. The EUROCOM Panther 4.0 comes with S/PDIF audio output, FireWire 800. S/PDIF is a digital audio interconnect standard based on the professional AES3 standard, it can carry two channels of PCM audio or multi channel surround sound. FireWire 800 is a high bandwidth, low latency isynchronous and asynchronous data delivery interface, ideal for audio, video and graphics transfer. High definition video interfaces. The EUROCOM Panther 4.0 comes equipped with HDMI 1.4a, Display Port 1.2, DVI-I. HDMI 1.4a is a high quality audio and video interface ideal for transferring uncompressed audio and video from the computer system to digital devices. Display Port 1.2 is generally used to connect a video source, being the computer to a display device but can also be used to transmit audio. DVI-I is a digital and analog interface designed to transmit uncompressed video. - Optional Solid State Drives for quiet operation. The EUROCOM Panther 4.0 offers optional Solid State storage Drives, because they do not have any moving parts, they offer perfectly silent operation during on site recording. - Expandability. The slot ExpressCard 54 slot is compatible with 34mm wide cards as well as 54 and allows for additional connectivity of peripheral devices to the Panther 4.0, including a Magma Express Box expansion chassis containing optional PCIe cards such as video capture, media transcoding, audio processing. - Battery backup in case of power loss during recording. The EUROCOM Panther 4.0 has a built in lithium-ion 78.44WH battery pack for added stability during potential power loss or need for transportation during operation. - Built in display, keyboard, track pad in a lightweight 12 lbs design. The EUROCOM Panther 4.0 is built upon a high quality workstation chassis with a built in display, keyboard and track pad for easy transportation during on the go project deployment. - Support for up to 32 GB of DDR3-1600 memory. The EUROCOM Panther 4.0 enables those with huge memory requirements for users aiming to create such things as full orchestral scores and sample based projects. - 9 in 1 media card reader. The system allows for fast and easy media transfer from Cameras and Recorders though the 9 in 1 card reader. - Graphics expansion. EUROCOM Panther 4.0 supports two VGA modules via standard MXM 3.0b interface with the ability to support up to 100W per card running in SLI or CrossFireX configurations, including the NVIDIA Quadro K5000M and K3000M cards. Fully OpenGL 4.1 compliant and supporting a colour depth of 10 bits per channel provides the tools graphics and multimedia professionals need to do their jobs on the go. For heavy duty rendering where the utmost accuracy is required, the K5000M’s ECC (error correcting code) memory is up to the task. NVIDIA Quadro cards offer OpenGL quad buffered stereo support, for a smooth experience working with complex 3D models.